WASHINGTON, DC -- A Washington-based think tank on international affairs has released a scathing report on Russia's "direct military intervention" in eastern Ukraine, concluding that President Vladimir Putin has led his country into war and has lied about it. According to a new report, pro-Russian separatists in Ukraine are receiving weapons and equipment from Moscow. The report, released on May 28, is titled "Hiding In Plain Sight: Putin's War in Ukraine." Amid persistent denials from Putin, it adds to mounting evidence of Russian involvement in the conflict between Ukrainian government forces and separatists, which has killed more than 6,300 people in eastern Ukraine since April 2014 and caused the biggest rift between Russia and the West since the Cold War. The researchers carried out in-depth digital analysis of open source information -- including satellite imagery, videos posted to the Internet from residents on both sides of the Russian-Ukrainian border, and photos posted to social media from eastern Ukraine by Russian soldiers themselves. The results are what the authors call "irrefutable evidence" that the conflict in eastern Ukraine is "a Kremlin-manufactured war -- fueled by Russian-made military equipment, fought by Russian soldiers, and supported by Putin." 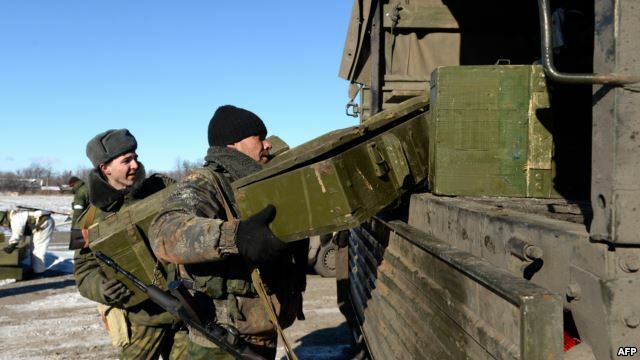 The Kremlin continues to claim that any Russians fighting in eastern Ukraine are there on their own volition, and that heavy weaponry used by the pro-Russian separatists was seized from Ukraine's military. But the Atlantic Council's analysis shows that several types of Russian-built weaponry and ammunition that have never been used by Ukrainian government forces have appeared in the hands of the separatists. One such weapon is a modernized version of Russia's main battle tank, which did not even enter service in Russia until 2013, the T-72B3. It is distinguished by an upgraded targeting and fire control system as well as other visible improvements on earlier models of the T-72 battle tank. Other uniquely Russian weapons seen in eastern Ukraine are the Pantsir-S1 antiaircraft vehicle, known as the SA-22, and 2B26 Grad missile launchers mounted on the chassis of a Kamaz truck. Russia's military began using those vehicles in 2012. The report also documents the presence in eastern Ukraine of Russian Dozor armored scout vehicles with advanced communications systems. Lighter weaponry found in eastern Ukraine that has never been in the Ukrainian Army's arsenal includes shoulder-launched surface-to-air missiles, or MANPADS, several types of rocket launchers, antitank guided missiles, land mines, and various types of small arms. Another charge in the Atlantic Council report is that Russian-backed forces in eastern Ukraine have received support during key offensives from heavy artillery that was fired from within Russia -- not from the separatist-controlled territory of Ukraine as Moscow claims. The researchers' evidence includes a combination of satellite data and sophisticated crater analysis from territory in eastern Ukraine that had been battlefields during the summer of 2014, such as an area outside of the village of Panchenkove. The crater analysis helped determine the trajectory and origins of artillery fire, with four of five different attacks said to have originated from Gukovo on the Russian side of the border. Journalists who visited that launch site in Russia have quoted residents who confirmed barrages were fired from there. They also discovered clear signs of Russian military activity -- including a large number of red endcaps from 122 mm artillery rockets. Satellite imagery also confirms the movement of Russian troops and camp buildups along the Ukrainian border. The Kremlin has described those deployments as part of tactical and strategic training exercises. But the Atlantic Council says the evidence proves that those camps have been used as "launching points for Russia's war in Ukraine," serving as “the staging ground” for Russian military equipment and troops to enter eastern Ukraine. The report says that Russian military commanders have ordered Russian troops who are sent into Ukraine to remove any insignia or other markings that would be obvious evidence of a Russian military incursion. It quotes military experts who estimate that Russia had at least 12,000 regular troops deployed in eastern Ukraine by March 2015, with about 50,000 at the staging areas on the Russian side of the border. The Atlantic Council researchers say the presence of Russian soldiers in eastern Ukraine is undeniable because of "a steady stream of coffins" that have been "returning to Russia under the label 'Cargo 200'" -- a coded term for the corpses of soldiers. The Atlantic Council noted that Russian opposition politician Boris Nemtsov, who was shot dead near the Kremlin on February 27, was killed while collecting evidence that the bodies of Russian soldiers have been sent home from Ukraine. The Atlantic Council said it only learned about Nemtsov's investigation after his killing, and that its own research is "distinct" from Nemtsov's efforts -- which were continued by colleagues and produced a report saying more than 220 Russian soldiers have been killed in eastern Ukraine. But it said it decided to time the release of its study close to the May 12 presentation of the Nemtsov report "to reinforce our common message: Putin led his nation into war against a peaceful neighbor and lied about it."